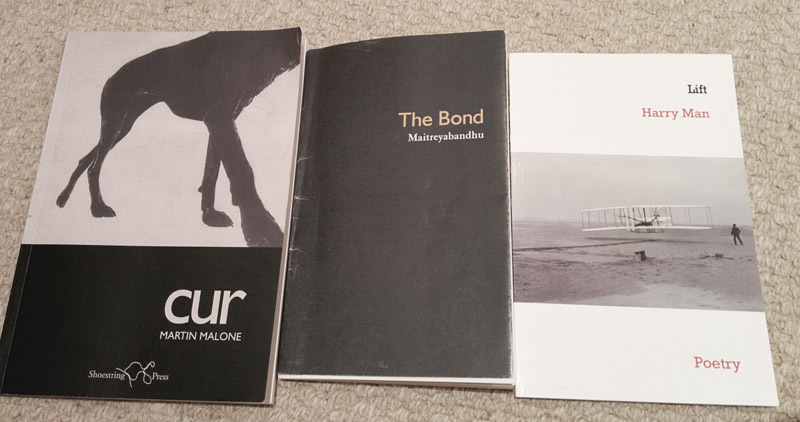 An interesting book came my way from Bloodaxe recently – a book of books, you might call it, or perhaps an anthology of collections. 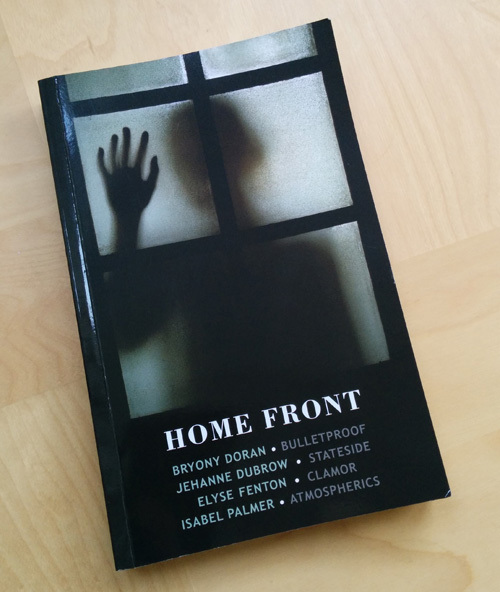 Home Front features four collections (each by a different poet, three of whom were unfamiliar to me) on the theme of war, specifically the experience of wives, lovers and mothers when their loved ones in the military are sent away to war. Isabel Palmer‘s contribution is Atmospherics, which includes a number of the poems from her excellent Flarestack pamphlet Ground Signs which I read and enjoyed a while back. The poems here are grouped into three, the central section focusing on the period of time her son spent in Afghanistan, sandwiched between two ‘Home’ sections, before and after. As a result, Atmospherics expands on Ground Signs through the inclusion of not just more material but also more experimental forms, as in for example the lists and glossaries that make up the six-part ‘Symbols’ sequence at the start of the final section. Isabel Palmer is from a military family, whereas Bryony Doran is not. When her son joined the army it was a surprise to learn ‘…that I’d become part of the army, another dazed parent / eating plastic packed sandwiches thrown casually on tables’ (‘Joining up’). Bulletproof is Doran’s first collection, in which she charts her own feelings of helplessness and fear for her son while he serves in Afghanistan, from wondering what her pacifist father would have made of it (‘Wormwood Scrubs’) to dealing with enquiries from well-meaning friends and trying not to be panicked by every Afghanistan-related media story. The poet ponders aspects of her son’s personality and childhood episodes, observes others who are also touched by the war and seems to be trying to make sense of her son’s choices and motivations. he’s putting in for his motorbike test. We later learn that ‘more soldiers have died in motorbike accidents since coming back than have died in Afghanistan’ (footnote to ‘Avoiding Traffic Accidents’). Although the poet’s son returns safely, clearly the mother isn’t undamaged by the experience. There is an edge of bitterness to ‘Tips for Parents of Returning Soldiers’ that goes beyond the ‘wtf’ irony of some of the earlier ‘found’ poems based on army-issued instructions or advice. Despite some slightly (for me) heavy-handed moments, this collection was an intriguing read next to Palmer’s. The final collection in the book is Elyse Fenton‘s Clamor, first published in the US in 2010 when it (intriguingly) won the Dylan Thomas Prize, despite not having published in the UK. We learn in the biog that Fenton is the wife of a US army medic posted to Iraq. It’s fascinating to plunge right on into another poet’s world, another poet’s take on the now familiar theme. I couldn’t help but feel a bit strung out at this point. What new? What more? But in the words of the time-honoured cliche (itself a time-honoured cliche)… I wasn’t disappointed. stranded noun, Rorschach of stars. Beautiful thing. ‘Home front’ is published by Bloodaxe, price £12. That’s a wonderful review – very informative. Many thanks. Robin, thanks for bringing ‘Home Front’ and its contributing poets to my attention. I read and enjoyed Isabel Palmer’s ‘Ground Signs’ after hearing her talk about and read extensively from it. This is another to add to my wish list.